Looking for some loud, heavy, angry, dissonant prog rock, sort of like 70s Crimson, but without all the soft parts? 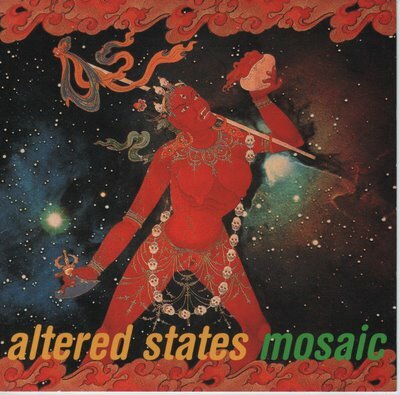 Well, look no more, Altered States is precisely what you need. Their music is relentless power, growling basses, screeching guitars and crashing drums. Sometimes this Japanese trio goes well beyond Crimson into realms where no prog rock band dare tread. This is manic music that bands like Happy Family, Ruins and YBO2 only hint at — it ain't pretty, that's for sure, but if "Red" and "Larks Tongues 2" doesn't do it for you anymore, then this surely will. I can only imagine what a live concert by these guys is like! Our three main movers are joined on various cuts by guests on saxes, violin, cello, voices, piano, clarinet, percussion, and so on. There are no lyrics as such; on the few tracks where voices are used (most notably on "Issai-Kai-Ku") it's just strange gobbling, yodeling, screeching, whispers and spoken gibberish. The first ten tracks total about 45 minutes, which — for this type of album, would be plenty long enough, but they top that off with the thirty minute "Suite Circle," which takes the album right up to the capacity of the CD medium. Anyway, this is some pretty intense stuff; if it sounds like something you'd like, then you probably should track it down.